If you're not supposed to wear white after labour day, what's the rule for white polka dots? Obviously, I have not gotten over my obsession with polka dots. I spotted this dress at Forever21 a few weeks ago and loved it. It's a button-up shirt dress, similar to my first foray into polka dots, but a more neutral palette. The dress has a retro feel to it and the pockets are a nice touch. The dress isn't lined, but the material is solid. I still wear my favourite slip from Free People under it though. I just love finding excuses to wear it because it's super comfortable. I also wanted to showcase my new sunnies. I love Ray-Bans, but I've always been an Aviator girl. 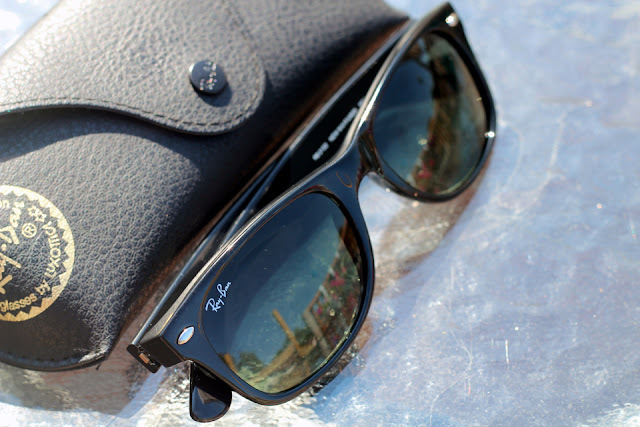 However, when I tried the New Wayfarer, I had to have them in my life. I always shied away from the Original Wayfarers because I found the shape unflattering on me, but the new version is the solution! They're from SmartBuyGlasses (no affiliation). I was a little iffy about the site because I had never heard anyone use it before but I took a chance. Plus, they had great prices, free shipping, and no tax / duty. How could I say no? They shipped via FedEx and arrived the very next day from HK. Very pleased with them. Aleeza, you look cute as a button!